If ever Rangers had incentive to keep driving home the wins, gritty or otherwise, tonight was it. Warburton’s men’s closest rivals, Hibernian, used their game in hand to capitulate wildly at Easter Road this evening, crumbling 0-3 to the side from Greenock who not only strolled to that comfortable scoreline in Edinburgh, but mostly matched their hosts for possession as well. It is a stunning result which sustains Rangers’ comfortable lead of eight points at the summit of the Championship, and summed up Stubbs’ side’s propensity for ‘bottling’ big moments, a characteristic which summed up their absolute humbling against then-Accies’ manager Alex Neil’s Hamilton side who found themselves benefitting from Terry Butcher’s men’s failure to impose themselves when it counted most. Not only did Morton tonight match Hibs for possession, they mostly matched them for shots too, and this was no ‘classic away mugging’ – this was a firmly-deserved victory. 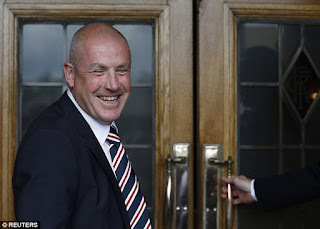 Rangers have real daylight now – and while this site highlighted how tough the upcoming period of fixtures are, Stubbs’ side have giftwrapped the Championship title to The Magic Hat’s men now, and it is up to Govan’s finest to receive that gift and use it wisely. Hibs have failed. Again. For all their bluster, for all their trash-talking about this and that, it is Rangers’ title to lose, and Rangers must grasp that opportunity with both hands and deliver. Eight points. It is quite a gap, and after four morale-crushing years in the wilderness, the Premiership is now truly within Rangers’ grasp. It is closer now than it has ever been. Time to take that step. Probably, while he sprays to the papers "You know an 8 point lead is the most fragile lead in football" ahahaha. When u least expect it thats when it hapins 2 nyt was the nyt the title is within our grasp, now lets put them to bed gers. Lets get ibrox bouncing every gme n get us secured and bck to the top wer we belong. WATP NO SURRENDER!! It!s official statistically Rangers are a better team than Barcelona! Both played 25, won 20, Drawn 3, Lost 2, 63 points each. Rangers goal difference is 50, 3 ahead of Barca's 47. Both are 8 points ahead of second team in league. Altogether now, Warburton is Magic, he wears a magic hat!! Rangers are playing pub teams. Barcelona are playing in the best league in the world. Its like comparing apples and oranges. Just accept we are on our way back to the SPL and be happy with that without making idiotic comparisons. The Statistics only tell the truth, I'm sure BeeGee's only having a bit of banter, so chill out and savour the moment, it's been a long time since we've had anything to cheer us up. Personally, I think we'd hammer Barca. Oh I'm real alright, season ticket holder (4 seats) longer than you can probably count to, I think you need a humour transplant because that was just banter, you want to lighten up. Mr Anonymous. Oh I'm real alright and a long time season ticket holder at Ibrox (4 seats) do you know where Ibrox is??? your anonymous and you sound like you need a personality and humour transplant, ok we maybe not hammer Barca but we'd certainly take 3 off them. Congratulations grandpa truly a day/night to remember!! I think you should all calm down, there is a lot of points to be played for. We aint exactly setting the heather on fire at the moment,,and as Warbs said after QoS game, we had our worst 20 minutes since he became manager!, so dont break out the champagne just now. Kiernan is a timebomb and we are not scoring goals at the moment. We are scraping through games by the skin of our teeth. We have a challenging run of games ahead, so lets just take one game at a time, get the 3 points, and look to the next game,, as for comparing us to Barcalona, Begee,,get a grip and stop embarrassing yourself son! I agree 100percent , and yes please stop comparing us to Barcalona its a wee bit early for that ! I would also like to ask some of our fellow supporters to stop taking the bait when these twats and unknown players from much lesser teams with no history try to take the piss. Season's not over yet. While it is great news, we need to maintain focus. Exactly,Cockman.We've been pants to be honest and were blowin oot our arse with 20 mins to go last week.Hope this gives us the lift we need.